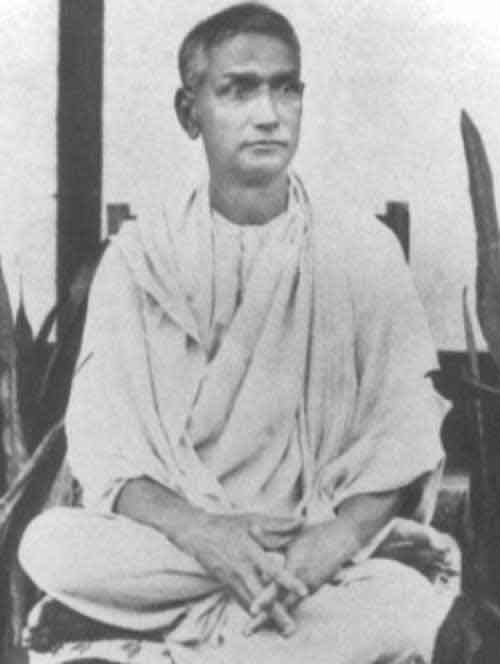 Swami Nirmalananda (1863 - 1938) was direct disciple of Shri Ramakrishna Paramahamsa. This is a collection of Swami Nirmalananda Quotes mostly from From book titled Swami Nirmalananda His life And Teachings, Vedanta Kesari and Prabuddha Bharata. Repetition of the Holy name of the Lord is very good. The mind will become pure through it. While repeating the name of the Lord you should keep remembrance of the Lord in your mind. Such repetition and remembrance will do much good. Mere repetition without the remembrance of the Lord will not be of much use. I do not say that this is easy. As you proceed with meditation you will see that you are, getting more and more realization. There is no use in merely reading the Shastras (Sacred Scriptures) and discussing about them. By meditation the mind will become pure, and when the mind becomes pure, realization of God follows as a matter of course. Ordinarily, we hold our mind on worldly matters. No result worth the name comes out of this. But if you fix your mind in the pure thought of God, you will feel a taste of real bliss. To make real progress in meditation, a part of the mind should always be given to God, whatever be the work you are engaged in. If you are able to do that, your mind will get concentrated as soon as you sit down for meditation. The thought of God can be kept continuously under all conditions, by a little practice. Suppose you have a toothache. Are you not able to attend to all your daily duties in spite of the continuous pain. Similarly by a little practice you will reach a state in which you cannot give up the thought of God even for a single moment. See and learn, observe and understand, exercise your body and mind in useful and healthy ways. Meditation requires the keenest perception and an extremely alert mind. Perhaps, you sit down to meditate, throw your mind and senses into a lethargic condition, a sleepy mood and after sometime get up satisfied that you went into deep meditation. If you practice that way, you will never be able to meditate. That is quite a different thing. For meditation you have to control your senses and direct your energies inward. The mind must he extremely active, I mean alert, in perceiving the finest objects. It must be well concentrated. If your nerves get blunt, how will you perceive fine objects? Cultivate the faculty of close observation and perception. Otherwise you cannot even form a mental picture of the object of meditation. When you do a thing, do it with the greatest care and whole-hearted attention. Non-attachment does not mean carelessness, indifference or half-heartedness in work. Work with one pointed attention, give up without a single thought. Those who receive instructions in a spirit of humility and gratefulness will improve; others, in whom the devil raises his horns will never improve. God is the source of everything. Have that conviction, surrender yourself and then practice tapasya. Such self-surrender made heroes of men, made them fearless, perfect workers. It is casting away the dross and taking up the gold. Renouncing the lower little self you become identified with the supreme self. That is yoga, and yoga is dexterity in action. Be dexterous in action; no matter what the action is.